The cutscene camera path is rendered out as a curved line. 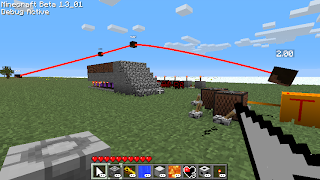 Can set whether a camera interpolates from the player's view point or not and how. 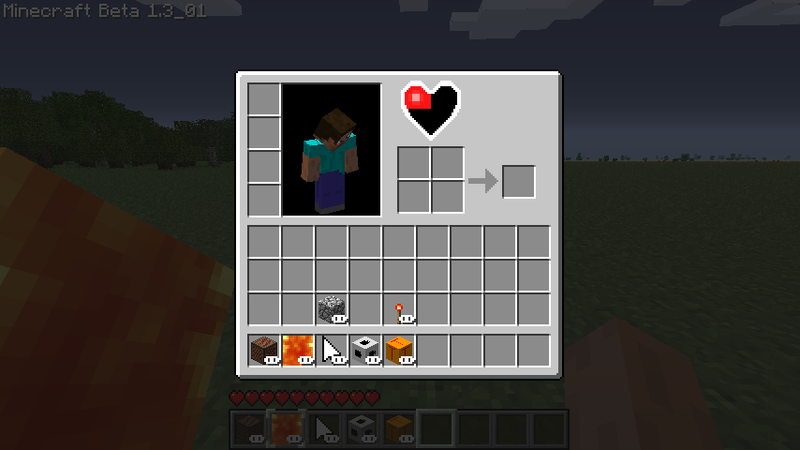 Player inventory will show how many heart pieces are picked up. Fixes bugs with resetting number of heart piece containers via /health and reaching four pieces. Very nice. Any plans for your next big addition? I know one thing in regards to the inventory would be useful: the option to have it pause gameplay while it's open. This would allow for more dynamic boss fights requiring use of multiple items in tandem. Hmmm, why would you need more than the 9 different items you can put on the hotbar for a single fight? Well, if the player had health items or equippable items (Iron boots, Water-breathing tools of some sort, fire-proof armor) in reserve, it would be nice if they didn't have to take the extra damage to prevent themselves from taking... well, the extra damage. To use the Zelda example again, those battle sequences allow the player to change items on the fly as the fight changes, making shuffling their inventory the least of their concerns. Once again, it's a lesser issue and hardly a universal one, but it'd be a welcome addition if you could customize it by the map commands/Escape menu. i saw you "like"'d a video on youtube, where someone could place a camera-block and a Camera-Screen.